Protestors gather outside the courthouse. 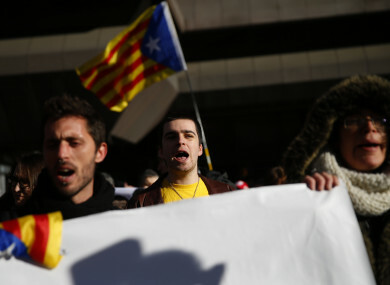 CATALAN SEPARATIST LEADERS accused of rebellion for trying to make their region independent from Spain launched their defence today at the start of their long-awaited trial. Twelve defendants are in the dock over an independence referendum, held on 1 October, 2017 in defiance a court ban, and a short-lived declaration of independence. More than 600 journalists are accredited to cover the proceedings which have been described as Spain’s ‘trial of the century’. Protests have been called in Barcelona, the Catalan capital, at 7:00 pm local-time. Carles Puigdemont, Catalonia’s former president who fled to Belgium days after the independence declaration on 27 October, is not among the defendants. Prosecutors say the defendants “called on citizens to participate in the 1 October referendum knowing it was illegal and that explosions of violence could therefore take place”. Email “Catalan leaders charged with rebellion as Spain is gripped by 'trial of the century'”. Feedback on “Catalan leaders charged with rebellion as Spain is gripped by 'trial of the century'”.